Comment: Quick Shipping with Trackable carrier. Orders sent out daily. The Book is in typical used-good Condition. Will show signs of wear to cover and/or the pages. May be some underlining, highlighting, and or writing. May not include any supplemental items (like discs, access codes, dust jacket, etc). Good Reading copy. Satisfaction guaranteed! Between Sea and Sahara gives us Algeria in the third decade of colonization. Written in the 1850s by the gifted painter and extraordinary writer Eugene Fromentin, the many-faceted work is travelogue, fiction, stylized memoir, and essay on art. Fromentin paints a compelling word picture of Algeria and its people, questioning France’s—and his own—role there. He shows French dynamism tending to arrogance, tinged with malaise, as well as the complexity of the Algerians and their canny survival tactics. In his efforts to capture the non-Western world on paper as well as on canvas, Fromentin reveals much about the roots of a colonial relationship that continues to affect the Algeria of today. He also reveals his own development as painter, writer—and human being. 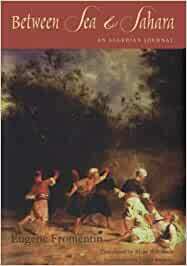 Now available for the first time in English, Between Sea and Sahara appeals to today’s reader on many levels—as a story of color, romance, and dramatic tension; as an eyewitness account of the colonial experience in Algeria; as a study in trans-genre text, foreshadowing Fromentin’s psychological masterpiece, the novel Dominique. And, as Valérie Orlando points out in her introduction, Fromentin opens a window on the ethos informing the fashion of Orientalism that flourished with colonialism. Eugene Fromentin (1820-1876) was a master in two arts. Especially known for his paintings of North Africa, he was the author of two travel books on the region. He also wrote the novel Dominique and a work on Flemish and Dutch painting. Both Flaubert and George Sand thought highly of him as a writer. Blake Robinson is a translator from French and Italian. He lives in Miami and Washington, D.C.